Experimental and theoretical scientists at Pacific Northwest National Laboratory had three articles on the most-accessed list in the Liquid, Glasses, and Crystals category of The Journal of Chemical Physics. Congratulations to our experimental and theoretical chemical physicists at Pacific Northwest National Laboratory (PNNL) who had three articles among the most-accessed ones in the Liquid, Glasses, and Crystals category of The Journal of Chemical Physics. The publication is the most highly cited journal in atomic, molecular, and chemical physics according to Thomson Reuters, making it the place to publish for leaders in the field. Scientists from PNNL routinely publish their research, sponsored by the U.S. Department of Energy's Office of Basic Energy Sciences (BES), in this journal. Two of the popular articles explained how cracks form in amorphous solid water films. The researchers proved that in some cases, gases trapped under the water films are released via fissures that form during crystallization. When thicker layers of gas are trapped, the gas can escape before crystallization. One of the articles, "The release of trapped gases from amorphous solid water films. I. "Top-down" crystallization-induced crack propagation probed using the molecular volcano," by R. Alan May, R. Scott Smith, and Bruce D. Kay, was viewed more than 400 times since March 2013. The abstract was viewed more than 1000 times. The companion article, "The Release of Trapped Gases from Amorphous Solid Water Films. II. "Bottom-Up" Induced Desorption Pathways," was downloaded 215 times; the abstract was viewed more than 400 times. Artwork from the articles graced the journal's cover. 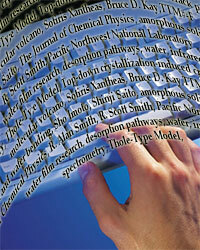 The third popular article, "Molecular Origin of the Difference in the HOH Bend of the IR Spectra Between Liquid Water and Ice," by Sho Imoto, Sotiris Xantheas, and Shinji Saito, demonstrated, through molecular simulations, the molecular origin of the observed difference in the HOH bend between liquid water and ice. The simulations were performed with the Thole-Type Model (TTM3-F), an ab initio-based flexible, polarizable interaction potential for water that was developed at PNNL under BES support. The abstract has been viewed more than 700 times, and the full paper has been downloaded 424 times since February 2013. Imoto visited PNNL for two months during this graduate research as part of a national grant for overseas visits from the government of Japan. He spent the other month of his scholarship at the Massachusetts Institute of Technology. There, he worked with experimentalists who measure the structure and dynamics of liquid water using infrared spectrometry. The research for all of the articles was supported by the BES Division of Chemical Sciences, Geosciences, and Biosciences: Condensed Phase Chemical Physics program. The fact that these articles are among the most often downloaded is evidence of the impact and leadership the program is having on the condensed phase chemical physics community at large.